ORANGEVILLE, Ontario – Parkinson Centennial Public School’s commitment to tackling a serious environmental problem has earned them recognition in the province. This fall, Ontario EcoSchools partnered with Bag2School to run a textile recycling contest for Ontario schools. The purpose of the contest and free fundraising program was to get students involved in diverting unwanted textile waste from landfills, while raising awareness about textile pollution. This week, Ontario EcoSchools announced that Parkinson Centennial PS was one of the contest winners. In North America, a staggering 85% of textile waste is disposed of in landfills, which equals around 3.8 billion pounds of unnecessary waste. According to Ontario EcoSchools, textile waste is almost 100% recyclable and 96-97% is recoverable. With textile recycling, however, that waste is diverted from the landfill and reclaimed items are either re-sold as used clothing or reprocessed as fibres that can be used for a wide range of purposes including insulation, cloth wipes, stuffing for vehicle seats and more. The students at Parkinson Centennial PS joined the contest and stepped up in a big way. 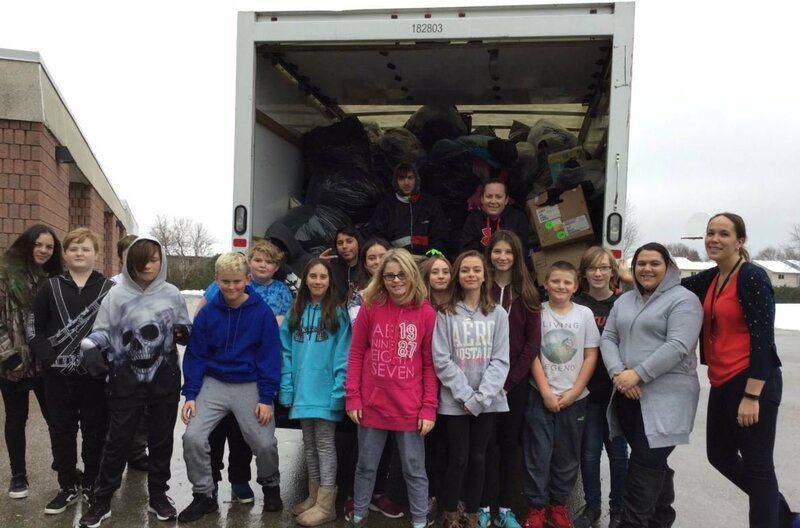 By the end of their fundraising drive, the school had collected more than 4,400 lbs of textiles – that’s 2,000 kg of waste that was diverted from a landfill. The contest winners were selected based on the highest total weight of textiles per student. With PCPS’s impressive total, which averaged 6.667 kg per student, they were named the winner of the province-wide contest, along with a school in TVDSB. Both schools have won a water bottle refill station, courtesy of Bag2School, so they can continue working toward their environmental sustainability goals. Throughout the fundraiser, PCPS staff said they were really impressed with the school community’s participation in the program. “It’s an initiative that the students wanted to take on and they’ve done a wonderful job leading the campaign,” said PCPS teacher Dayna Hoekstra.